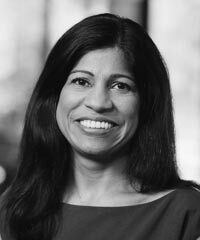 Lata Reddy is Vice President and head of Corporate Social Responsibility for Prudential Financial, Inc. and President of the Prudential Foundation. She is responsible for overseeing the company’s philanthropy, impact investments, corporate contributions, and employee engagement activities. Reddy joined Prudential in 1997 to manage the foundation’s education grant-making activities. In 2002, she became Vice President of the Prudential Foundation with responsibility for developing and leading the strategic direction of its grant-making policy and programs. Before joining Prudential, Reddy was an attorney in the Office for Civil Rights in the New York regional office of the U.S. Department of Education. She serves on the boards of Lead NJ and Living Cities and is an Aspen Institute Fellow.